John Fitzgerald Kennedy, 1917–1963. 35th President of the United States, 1961–1963. Typed speech reading copy, with autograph annotations by Kennedy, three pages, 8” x 10½”, [Wilmington, Delaware, May 14, 1953]. This is a choice relic from the beginnings of Kennedyʼs serious effort to spread himself beyond Massachusetts, establish a nationwide political presence, and position himself to seek the White House. These are the first three pages of his reading copy of his speech to the Jefferson-Jackson Day Dinner at the Hotel Dupont in Wilmington, Delaware, on May 14, 1953. Kennedy has annotated each of these three pages in blue ballpoint pen. Kennedy was nothing if not politically ambitious. After serving six years in the United States House of Representatives, he challenged and defeated incumbent Massachusetts Senator Henry Cabot Lodge, Jr., in 1952. A Democrat, the youthful and charismatic Kennedy defeated an entrenched Republican in what was otherwise a Republican landslide with Dwight D. Eisenhower at the head of the ticket. After his election to the Senate, Kennedy immediately began to range beyond Massachusetts, making himself known in other areas of the country and laying the groundwork for a future presidential bid. In 1953 alone, the freshman Senator spoke in Connecticut, the District of Columbia, Indiana, Maryland, New York, Rhode Island, Tennessee, and, in this speech, Delaware. He spoke more and more around the country in the following years and gathered even greater nationwide appeal by delivering the high-profile speech to nominate Adlai Stevenson for President at the 1956 Democratic convention. His loss of a tight, three-ballot race for the vice presidential nomination was likely a blessing rather than a curse: Going down to sure defeat as Stevenson’s running mate—the popular Dwight D. Eisenhower carried 42 states, including Kennedy’s home state of Massachusetts—could well have damaged Kennedy’s political future. 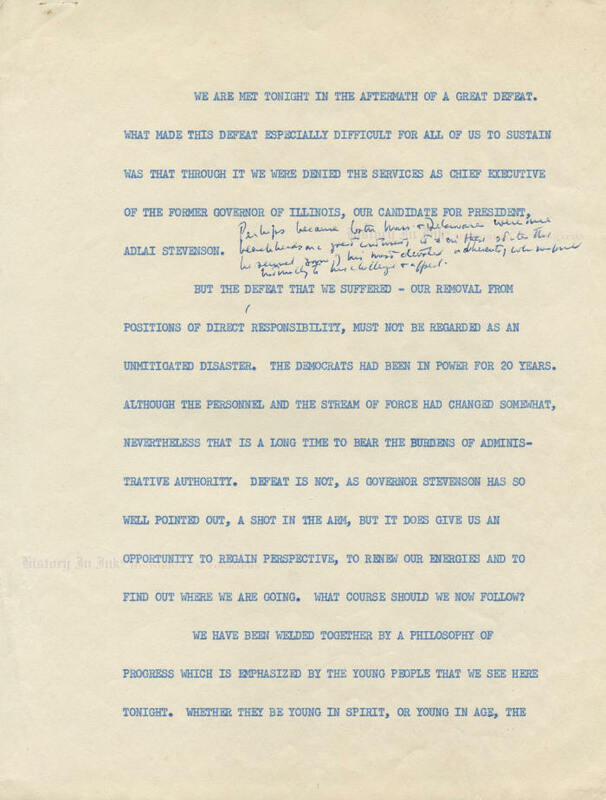 The Kennedy Library archives contain two typed versions of this speech. One, a nine-page, double-spaced version, is virtually identical to this one in the first three pages. The only differences appear to be two words, one noted in a handwritten change on the Kennedy Libraryʼs copy that appears in type in this one, and the other inserted into this one in type at some point. The other Kennedy Library version is the three-page, single-spaced advance copy that presumably was distributed to the press. As these pages show, Kennedy continued to make changes in his speech right up to the time that he delivered it. The “redaction of this speech made for the convenience of readers and researchers” on the Kennedy Library website, which the Library says “is based on the Reading Copy of the speech,” does not contain the changes that Kennedy has made here by hand. On the third page, he has written “* Bipartisan” at the top, following the end of a sentence starting on the previous page: “Indeed, I expect to hear any day that the President can muster a majority in the Senate—all he needs is two more Democratic seats. * Bipartisan.” Kennedy also moved the words “in the House” from one place to another to correct the syntax, and he has stricken the last part of the first full paragraph in which he originally intended to complain that the Republicans intended “to turn over the billions and billions of dollars of tidelands oil resources belonging to all the people to a few.” The text reproduced on the JFK Library website does not show that Kennedy deleted that part from the speech. The Kennedy Libraryʼs double-spaced copy of this speech is nine pages long.  Unfortunately, we have no information about the remaining six pages of Kennedyʼs actual reading copy. Perhaps these three pages were saved because they bear Kennedyʼs handwritten edits. These pages are in very fine condition. They all have a diagonal fold in the upper left corner, no doubt from where Kennedy himself folded them as he worked through the speech and then spoke from this final draft, and staple holes from where they were originally bound together. There are a few other minor handling marks, but nothing significant. Click here to see other Presidents and First Ladies autographs.